A number of characteristics make geckos great pets: They're mostly small, affordable and easy to feed. The downside of keeping geckos is that most species are nocturnal and, therefore, not very visible pets. The exceptions are geckos of the genus Phelsuma. Most of the 70 Phelsuma species are diurnal -- they do their doing during daylight. Almost all geckos from the genus Phelsuma are diurnal, appropriately named day geckos. Historically found in Madagascar, Mauritius and a few other islands in the western Indian Ocean, day geckos have also been introduced by humans to Hawaii and South Florida. Adorned with names like gold-dust gecko (P. l. latticauda), yellow-headed gecko (P. klemmeri) and blue-tailed gecko (P. cepediana), these lizards are, not surprisingly, beautiful and highly prized by hobbyists. Day geckos are predominately green with blue, red or yellow markings, and range from about 3 inches to 12 inches in total length. In captivity, day geckos eat insects, banana, papaya, baby food and commercially prepared gecko food. Day geckos are excellent vivarium lizards, but they shouldn’t be handled; many Phelsuma species have very loosely attached skin that will come off if the lizard is grasped or restrained. Lygodactylus geckos are very small lizards from Africa. Not commonly seen for sale, these geckos are not only diurnal but actually heliothermic -- they bask in the sun for warmth. Most notable among the 60 species is the bright blue Lygodactylus williamsi; a species found in a very restrictive area, less than 2 square miles in size. Though they are not often seen for sale, geckos of the genus Gonatodes are diurnal geckos from the Caribbean Islands as well as Central and South America that reach about 6 inches in total length. These small insectivores exhibit sexual dimporphism, as the males are larger and often more strikingly colored than the drab females. While able to climb rough surfaces well, Gonatodes geckos do not have adhesive lamellae on their digits and cannot climb glass. Eurydactylodes geckos are found on the island of New Caledonia and Koumac. 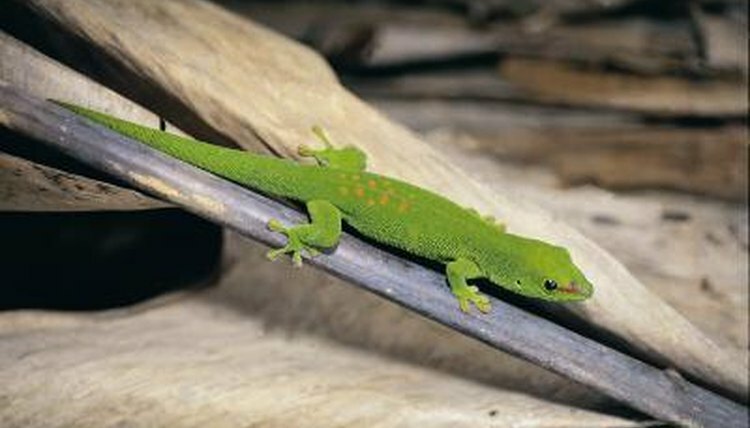 These poorly known geckos live on the lower portions of tree trunks in their forest habitats. These lizards are small – generally less than 6 inches including the tail – and are nocturnal, but will feed, drink and occasionally prowl during the day. Moorish geckos (Tarentola mauritanica), sometimes called crocodile geckos, are primarily nocturnal but are sometimes seen basking during the day. These lizards reach about 6 inches in length and are native to South Europe and North Africa, but they have been introduced to Florida, and at least one specimen has been found in California. Moorish geckos change colors, lightening considerably at night. Moorish geckos primarily consume invertebrates and are sometimes seen under porch lamps, hunting insects. Some species that are normally nocturnal may occasionally be active during the day; this is especially true of captive-bred creatures or long term captives who have become accustomed to their keepers. Such behavior is most common among robust species like tokay geckos (Gekko gecko) and leopard Geckos (Eublepharis macularius), and is usually observed when geckos are kept in habitats that lack bright day lights.